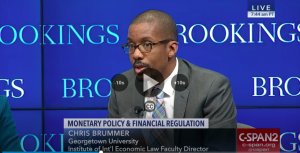 This morning I had the pleasure of speaking at Brookings on a panel after a speech delivered by Randall Quarles, the Vice Chairman of Supervision for the Federal Reserve. The purpose of Quarles’s speech was to unveil a new approach on stress tests. His comments were then followed by Q&A with Martin Bailey, and a wide ranging panel discussion that included fintech, with Kathleen Day, a Professor at the Carey Business School, Randall Guynn, a Partner at Davis Polk and Rodgin Cohen, the Senior Chairman of Sullivan & Cromwell.